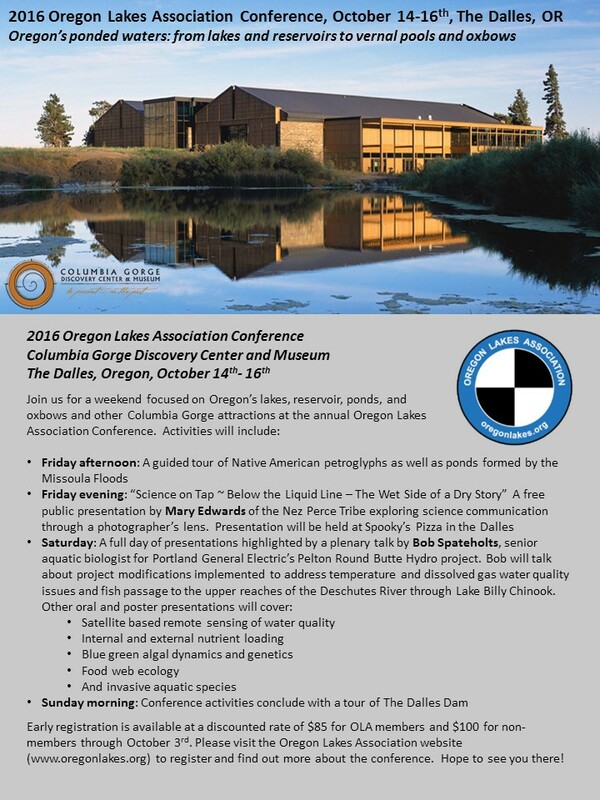 Please join us at the 2016 Oregon Lakes Association’s annual conference scheduled for October 14th - 16th along the Columbia River in The Dalles. This year we seek to gain and share a better understanding of reservoirs in particular. Reservoirs and their hydrology are particularly dominant on the landscape in The Gorge, and are a primary focus of the conference. We also will be exploring some of Oregon's smallest ponded features, vernal pools. Ephremeral and transient in nature, vernal pools are host to a unique biology derived from the pressures of any even more unique physical nature relevant to Oregon's more common ponded waters. In order to support future research on Oregon Lakes we will offer a raffle and auction to help fund our scholarship program. Petroglyph Tour ~ Join us for an afternoon hiking through ancient history of the Columbia River basin. We will meet at the Columbia Gorge Discovery Center & Museum, 5000 Discovery Way, The Dalles for carpooling across the river to the site. From there we will go on a guided 1/2 mile and approximately 1 1/2 hour hike. Dress appropriately with hiking shoes and layered clothing. As a bonus, there may be an opportunity to view some kolk ponds formed in the basalt bedrock from raging Missoula floodwaters. Parking fees onsite included for carpoolers. 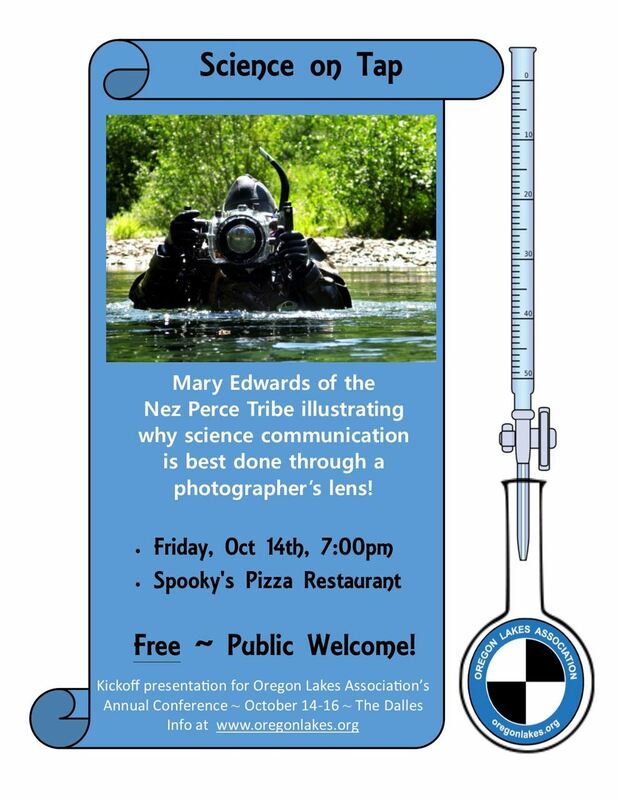 Science on Tap ~ Below the Liquid Line – The Wet Side of a Dry Story ~ presenter Mary Edwards explores science communication through a photographer's lens! Join us at Spooky's Pizza Restaurant, 3320 West 6th Street in The Dalles for an educational presentation which will have you rethinking how to make a presentation. The event is no host, but is free and open to the public. Our journey through Oregon's ponded waters continues at the Columbia Gorge Discovery Center & Museum, 5000 Discovery Way, The Dalles, where we will have a full day of talks & poster sessions, plus plenty of time to explore the museum itself. Presentations will be highlighted with a plenary talk by Bob Spateholts, senior aquatic biologist for Portland General Electric’s Pelton Round Butte Hydro project. Bob will talk about project modifications implemented to address temperature and dissolved gas water quality issues and fish passage to the upper reaches of the Deschutes River. Other presentations will cover climate change and water temperature, management of aquatic invasive plants, reservoir nutrient loading, and volunteer lake monitoring. Conference activities conclude on Sunday with tour of The Dalles Dam. Meet onsite at 11:00 am, with tour starting at 11:30. Transportation not included. If you have any questions, please contact Rich Miller, the OLA Program Chair, at richm@pdx.edu or (503) 725-9075. Cancellation Policy: Registrations are fully refundable 15 days before event, minus a $10 or 3% processing fee whichever is greater. Refunds will not be available after this time.